The most dangerous food in your kitchen! Why the fuss about Avocados? Avocados: The most dangerous food in your kitchen! Like the bagel, avocados are immensely popular but do require use of a knife to enjoy. Unfortunately, the similarity to bagels does not end here. I treat at least one patient a month who has cut his or her hand when cutting or pitting an avocado. Usually these injuries are deep and need surgery to repair a severed nerve or tendon. The reason for the danger lies in the fact that avocados are very soft on the outside and have a hard smooth pit on the inside. Injuries either happen when someone is holding the avocado in the palm of the hand and cut towards the palm or when trying to pry the pit out of the sliced avocado with the pointed end of the knife. Using the proper tools and technique injury can easily be prevented. If you do cut yourself it means one more surgery for me, but it may mean a severe problem for you requiring surgery and months of therapy, not to mention the injury's effect on your ability to work. Please watch the videos below to learn more. 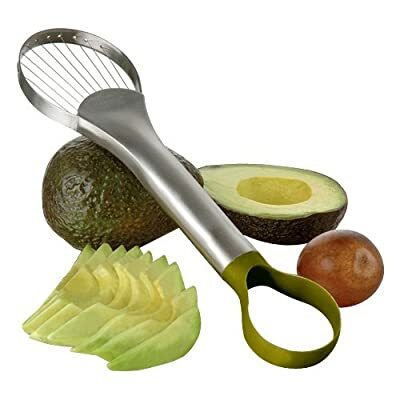 Due to the risk of injury from pitting avocados, many companies have created simple yet effective tools to help chefs quickly and safely remove pits from avocados and other fruits quickly and safely. Dr. Grabow has not tested any of these devices nor does he have any financial interest or benefit in your purchase of these utensils. Please take a look --- you may find something you like. *WHAT NOT TO DO* Don't hold it in your hand when you slice it. Don't hold it in your hand while using a knife to remove the pit. Dont' hold it in your hand when you slice it. Don't hold it in your hand while using a knife to remove the pit. (Yes I know I repeat myself but it is that important!) Yes - you do look cool when you use a knife for everything but when you look at someone as they take your picture and you slice your hand, you will have several more cool pictures from the ER waiting room, treatment room, and while you get your stitches. Please watch the videos below. Ultimately, the easiest way to treat a hand injury is to prevent it. THIS IS A PROFESSIONAL! Please notice the key safety step of holding the avocado with a folded towel in your hand. This is the same way that most of my patients use to CUT THEIR HAND. Think it is just a cut - think again. I have had several patients with nerve and tendon injuries with this method minus the towel. This guys technique is somewhat dangerous but at least he admits it. Notice how having a folded towel in his hand would have given him another level of safety. The cutting techniques above are dangerous if you make one mistake. If you already made and tasted some Sangria, Mojitos, or Margaritas - it is best to use the 3-in-1 tools shown in my video. I have had several patients who cut their thumb in the process of twisting the pit out with the knife as well as cutting their fingers when pulling off the pit to throw it away. To the left is a picture of a real person with a finger laceration due to the pitting method shown above. My recommendations may not be "cool" but you don't look too cool trying to explain to your friends that you cut yourself taking the pit out of an avocado. To give your children, spouse, or loved one a true understanding of avocado injuries I have provided the following images. WARNING - these pictures ave very graphic. Here are some photos of a patient's avocado pitting injury. Small knife wound causing an nerve and tendon injury requiring surgery.